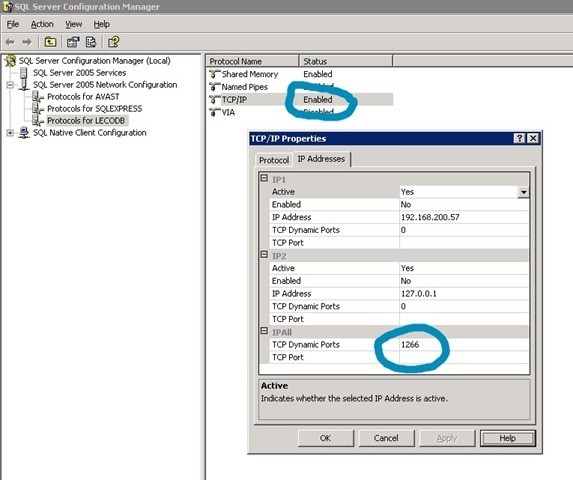 Client Applications normally connect to the Default SQL Server Instance on TCP Port 1433. Additional Instances are normally allocated Dynamic TCP Port Numbers by the Server Operating System. For the benefit of Clients, Microsoft SQL Server 2005 provides the “Browser Service” (UDP Port 1434) to advertise the Names and Port Numbers of each Instance of SQL currently installed. When a Client requests access to a particular Instance, the Browser Service responds with the appropriate Port Number and the client uses this to establish a connection. The SQL Browser Service (UDP 1434). The Default SQL Instance (TCP 1433). Additional Named Instances (Dynamic TCP Ports). It is easy to see that in this scenario, it is impossible to pre-configure the Firewall for a Dynamic Port (since we do not know what the port number is going to be). Therefore, additional Instances should be allocated a “Fixed TCP Port Number” using the SQL Server Configuration Manager. In this way, the correct firewall Exceptions can be configured. To view the current Dynamic Port of a particular Instance, use the “SQL Server Configuration Manager” (see below). 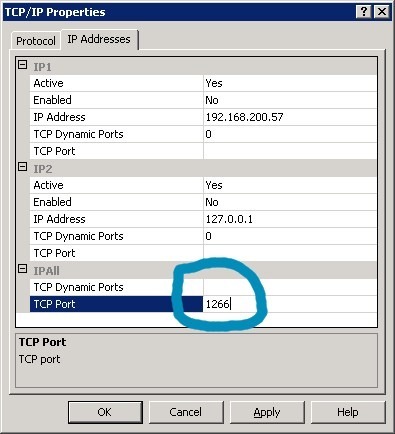 To turn this into a “Fixed Port”, remove the current value from the “TCP Dynamic Ports” field and place it into the “TCP Port” Field. Restart the SQL Service. It will now be a case of Configuring the SQL Server Firewall to pass traffic to the Fixed TCP Port (in this example Port “1266”).